I’ve sometimes been astounded (and frustrated) by what appears to me to be a simple, right there concept, only to find children who have difficulty grasping it. This always gets me thinking about how I can change my methods to reach them in a more effective way. 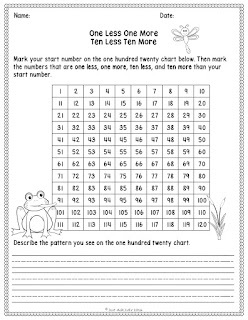 While driving down the highway on a recent trip, I was brainstorming more compelling ways to teach the concept of ten less and ten more. I’ve always emphasized the pattern on a hundred chart and spent considerable time modeling and practicing counting varied concrete materials by tens off a decade number (ex. 3, 13, 23, 33, etc.). 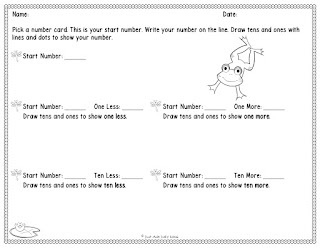 I’ve seen worksheets using base ten model representations. I decided it would be worthwhile to back up a step, be more concrete and explicit, and actually use base ten blocks to develop understanding of the concept of one less/ more and ten less/ more to reach more children. 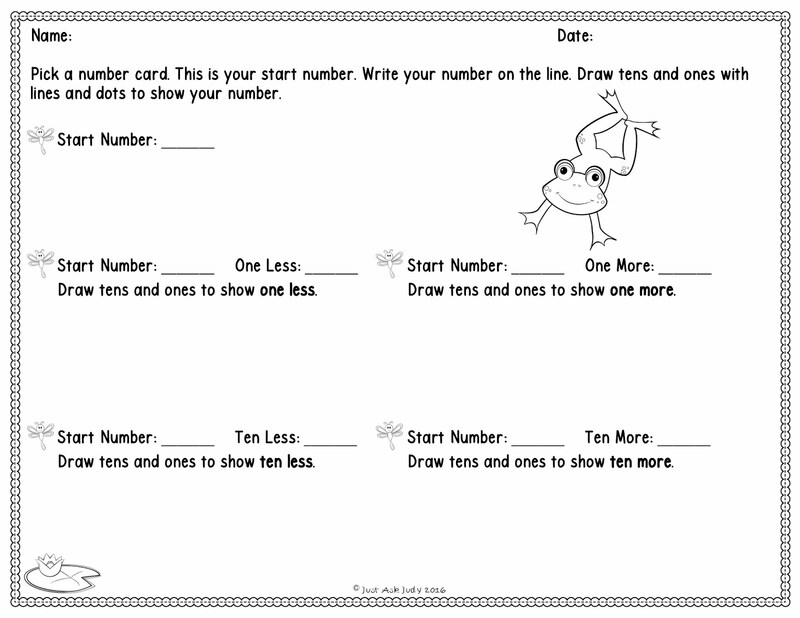 So, I created an adorable frog themed place value mat and two recording sheets to share for this activity. 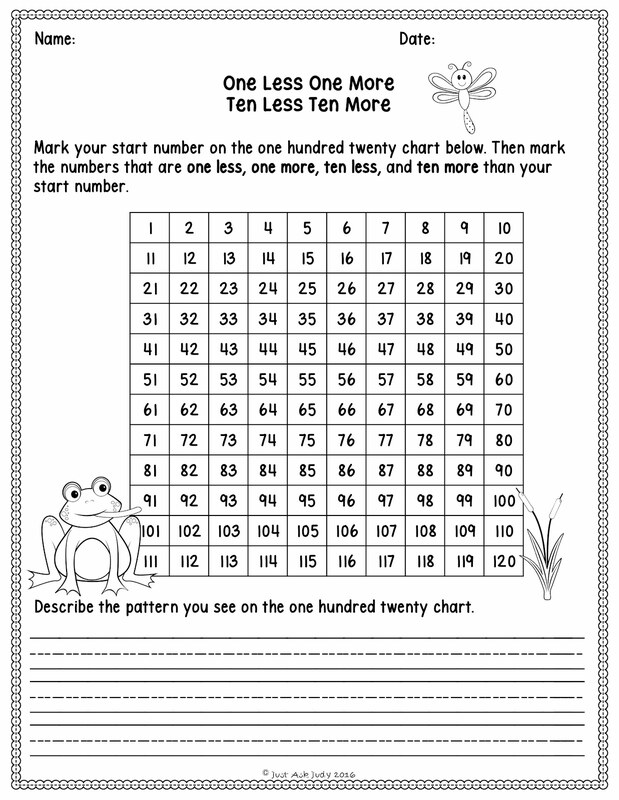 The second sheet helps to reinforce the relationship of these numbers to each other on a one hundred twenty chart. 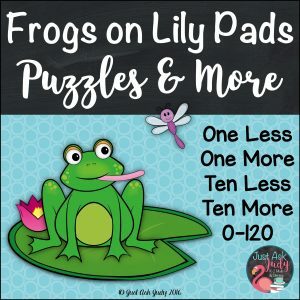 One Less One More Ten Less Ten More Developing Understanding with Base Ten Blocks can be downloaded for free from my TpT Store. Suggestions for using are included. You might also be interested in purchasing this related one less one more ten less ten more resource for practice and review. Just click on the picture. I have been on a number sense bandwagon for a few years now. I have learned that developing number sense is critical for mathematical achievement. Number sense is to math as phonological awareness is to reading. One component of number sense is understanding the relationship of numbers to one another. Linking real quantities to counting numbers helps to develop this. So yes, I really believe and implement this in my teaching and creating! Let me know how this resource works for you and your kiddos. There is always tweaking to be done!